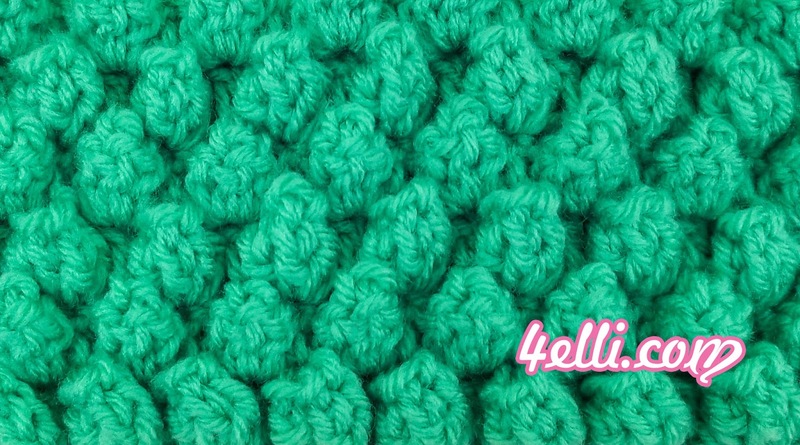 How to crochet the popcorn stitch!! Row 2: chain 3, turn, (chain 3counts as the 1st dc), 1 popcorn into the 2nd [for popcorn: 5dc, drop the loops from hook, insert the hook from front to back into 1st dc and into dropped loop and make a slip stitch, chain 1], *1dc into the next, 1popcron into the next* repeat from * to * across. To finish the row: 1dc into the last stitch (ending with 2dc in row). Row 3: chain 3, turn, (chain 3counts as the 1st dc), 1 popcorn into the 2nd [for popcorn: 5dc, drop the loops from hook, insert the hook from back to front into 1st dc and into dropped loop and make a slip stitch, chain 1], *1dc into the next, 1popcron into the next* repeat from * to * across. To finish the row: 1dc into the last stitch (ending with 2dc in row). Row 4: chain 3, turn, (chain 3counts as the 1st dc), 1 popcorn into the 2nd [for popcorn: 5dc, drop the loops from hook, insert the hook from front to back into 1st dc and into dropped loop and make a slip stitch, chain 1], *1dc into the next, 1popcron into the next* repeat from * to * across. To finish the row: 1dc into the last stitch (ending with 2dc in row).